The long-awaited Suzy Cube ($3.99) lives up to the hype. Developer NorthernBytes and publisher Noodlecake have created the new pinnacle of 3D control on mobile, and paired it with a platformer that’s a lot of fun, regardless of the fact it controls like a dream. If you ever played Super Mario 3D Land or World, you’ll likely be familiar with the way Suzy Cube‘s camera and platforming work. It uses a fixed camera that moves only when necessary, such as at certain points in the level when the perspective needs to change. It also means that a lot of sections of the game feel kind of like looking in on a diorama, or or almost two-dimensional with some 3D movement. And honestly, this kind of perspective feels a bit more natural than many 3D platformers, because think about how you navigate spaces. You consider walking through hallways, and while you are moving through three-dimensional space, it feels a lot like just walking down a corridor in a two-dimensional manner. That’s what this kind of forced-camera perspective does. Admittedly, it was originally designed for the 3DS, where the 3D view of the screen gives things a perceived depth that helps out in some cases, but it still really works on 2D screens! 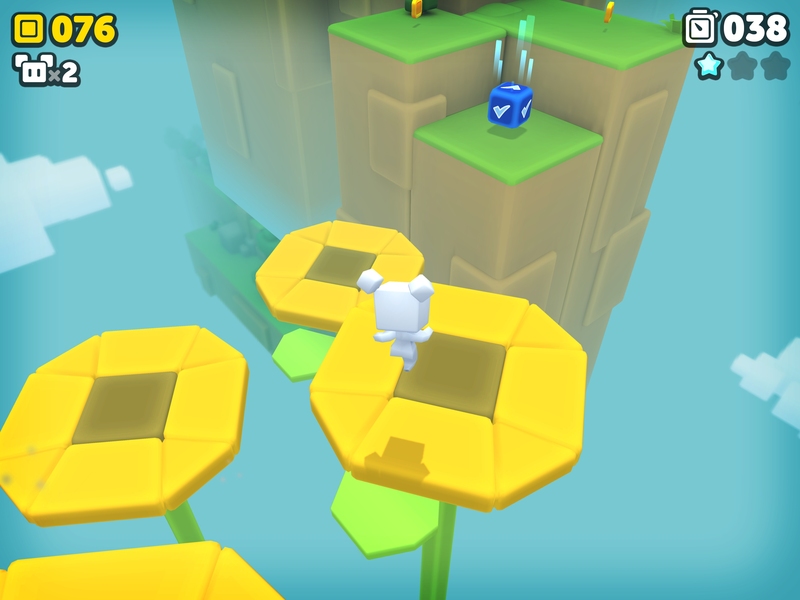 For Suzy Cube, a 3D platformer on mobile, this makes it a lot easier to navigate the world. You never have to worry about the camera being an obstacle. Well, at least not intentionally, as the game does strategically hide some secrets in the landscape. But when you have these very regimented segments of levels to navigate, it prevents a lot of frustration that pops up from wide-open three-dimensional level design. 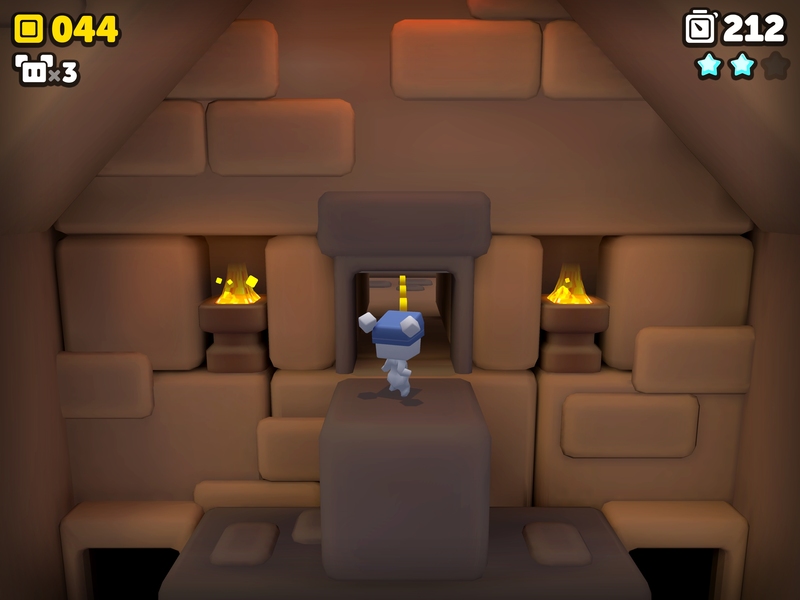 More developers need to ape this kind of level design, because it works incredibly well in Suzy Cube. It also helps that Suzy Cube has some fun level designs to play through. The pyramid levels, where you have two different paths to play through to unlock the exit, are fun in part because of their non-linearity. The three stars in each level are often hidden away in clever spots that reward you for going off the beaten path. Again, the perspective makes things feel like you’re always on the proper path, but there are just enough elements that reward you for going against the grain a bit. The only things that didn’t really work for me were a low-timer level where you often slide down snowbanks (the lack of depth perception hurts here), and the boss fights, which use the same boss with a variation in patterns. Anyone making a 3D game with a virtual stick needs to play Suzy Cube and study how well it works. I hope the developer gives some talks somewhere, because the world needs to know how to make 3D games control this well. I think it might be the use of aggressive stopping of Suzy and a limited use of inertia. The point is that it feels great to control Suzy with the touch controls, and the gap in accuracy between the touch controls and physical controls is minimal at best. You absolutely have to play this game just to see how good a 3D platformer can feel on mobile. It’s witchcraft. I have no clue how NorthernBytes pulled this off, and I hope other developers figure out how to mimic these kinds of controls so that our 3D games on mobile all feel amazing. Maybe you’re still a skeptic. At least you have the option of whether you want to use physical or virtual controls, as the game does support MFi controllers! Seriously, go back to touch controls after using the physical controls. The difference really is as small as it possibly could be. The game also supports the Apple TV, both with the Siri Remote and MFi controller support. However, there aren’t cloud saves, so choose your platform wisely. 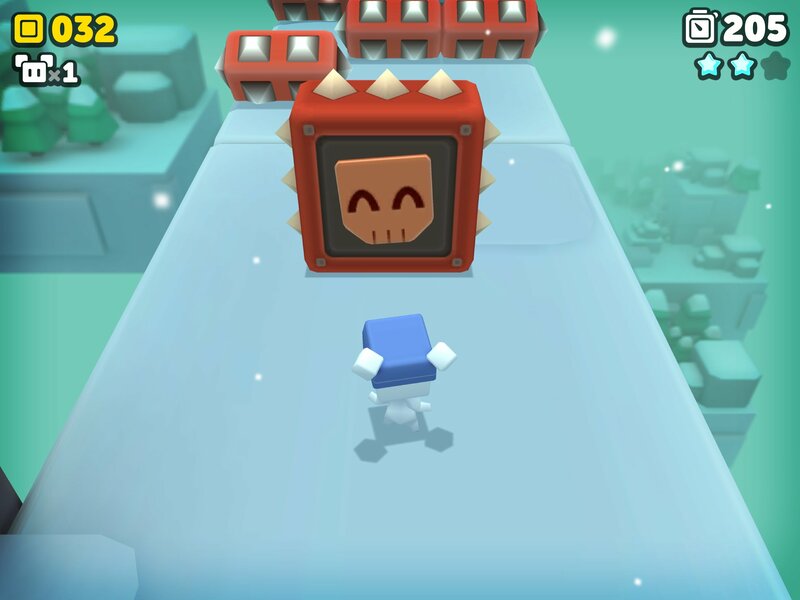 Suzy Cube has several different powerups, Mario-style, that not only let you do things like slam the ground and fly around, but also discover hidden things in previous levels. For example, you see a block that has cracks in it, but you can’t break it right away. Until later on when you find out how you can break them…and your powerup hats carry from level to level. Of course, if you take damage, you lose your powerup hat, which might complicate your quest to discover what those blocks! The one downside to this system is that Super Mario Bros. 3 and Super Mario World at least had item slots so you didn’t have to find particular items each time, and you can’t just quit a level once you get the hat you want. Suzy Cube contains five worlds with five levels each that you have to complete in order to beat the game. Then, each world has an optional level that unlocks after you collect enough stars, along with 11 levels in the Secret World. Not exactly so secret if it’s right there on the screen! Those optional levels are a lot of fun, because they really play with the mechanics of the game. One level is a Plinko board, where you have to figure out the proper path downward in order to get all three stars. Another one I like deliberately uses forced perspective to mess with your perception of where different blocks exist in 3D space. It’s a lot of fun. Suzy Cube herself is a simple character design, but the animations go a long way toward giving her a strong sense of personality. Most everything is cubic, but again, they aren’t just anonymous enemies, they feel like they’re an alive part of the world. My favorite enemy is one that mimics your movements with a smile on your face, and you just have to trick them by jumping and then going around. Another enemy you have to knock off of a ledge, and it sweating and looking panicked when it’s near the edge is another touch of attention to detail. Suzy Cube was in development for three years, and it’s clear just where all that time went into. Everything about the game is absolutely well-crafted to a ridiculous degree. 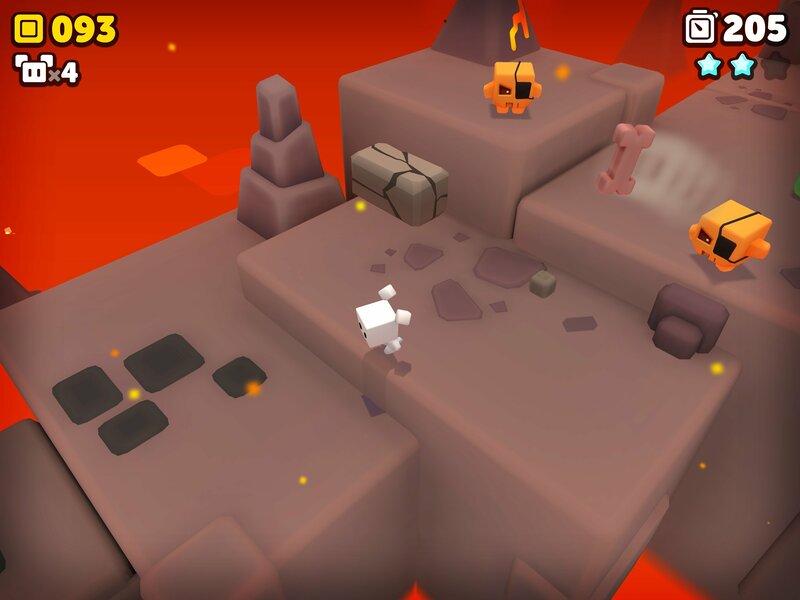 Suzy Cube is one of the best 3D platformers ever made for mobile, and you ought to play it.